Immerse yourself in a full day experience. The majority of our population choose to spend life in chaos and stress over creating the necessary space to be still. It's in the stillness that we are able to observe & reflect on the thoughts & energies we're holding. Here we will create that space, not only to observe but also to move & transform any heavy energies. An opportunity to just be. Kimber-Lee and Keri will hold space for you pause & reflect, exploring anything stuck or discordant in body & mind, and transmute these energies into something lighter. In today's busy world, many of us don't offer ourselves the space to just breathe. But it's in these moments of quiet & stillness that we are able to find clarity and compassion. Through yoga, meditation, sacred sound, ceremony, healthy meals, & self reflection we'll create the space for a healing and relaxing retreat. Kimber-lee has spent her entire life surrounded by performing and healing arts. 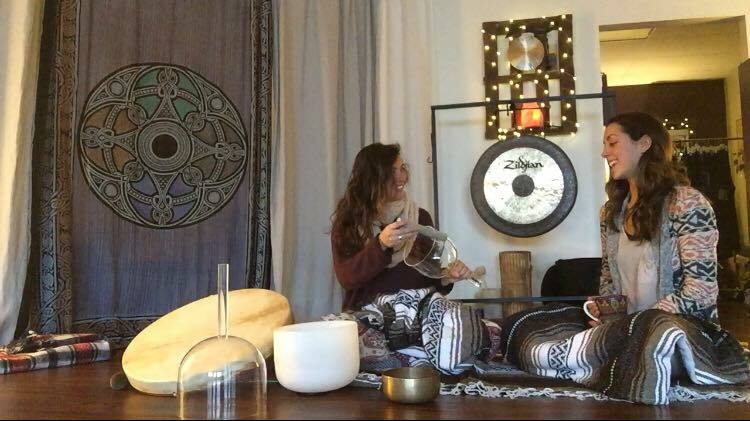 After working for years as a professional singer, and the study of advanced sound healing and energy medicine with Lisa Murphy, sound has become a crucial part of her individual practice as well as in her teachings. Though her education has a strong technique & alignment background, her teachings offer much more than just poses on the mat. Through yoga and sound, her mission is to help others find respite from the chaos and conditionings of our day to day life and allow the space for healing and understanding to take place. Keri’s passion for the practice of yoga and meditation was ignited in 2012 after taking her first meditation class. After that she began the physical asana practice and has been expanding her practice consistently since 2013. She holds her Master’s of Social Work degree and uses positive psychology, mindfulness and meditation concepts to help others heal. She strongly believes in the law of attraction and views mind-body-soul as a union that deserves to be nurtured in order for individuals to thrive. Retreat cost is refundable up to 7 days prior to event. Within one week - refund of 50% will be returned.